A few months ago I wrote a blog post on a simple JP2 file structure checker. This led to some interesting online discussions on JP2 validation. Some people asked me about the feasibility of expanding the tool to a full-fledged JP2 validator. Despite some initial reservations, I eventually decided to dedicate a couple of weeks to writing a rough prototype. The first results of this work are now ready in the form of the jpylyzer tool. Although I initially intended to limit its functionality to validation (i.e. verification against the format specifications), I quickly realised that since validation would require the tool to extract and verify all header properties anyway, it would make little sense not to include this information in its output. As a result, jpylyzer is both a validator and a properties extractor. Some of these boxes are required (indicated by solid lines in the figure), whereas others (depicted with dashed lines) are optional. Some boxes are 'superboxes' that contain other boxes. A number of boxes can have multiple instances, whereas others are always unique. 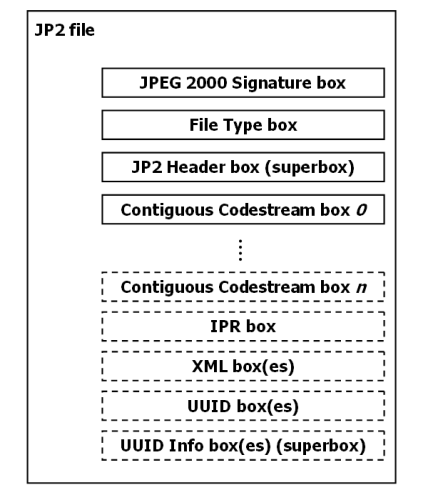 In addition, the order in which the boxes may appear in a JP2 file is subject to certain restrictions. This is all defined by the standard. At the highest level, jpylyzer parses the box structure of a file and checks whether it follows the standard. At a lower level, the information that is contained within the boxes is often subject to restrictions as well. For instance, the header field that defines how the colour space of an image is specified only has two legal values; any other value is meaningless and would therefore invalidate the file. Finally, there are a number of interdependencies between property values. For instance, if the value of the 'Bits Per Component' field of an image equals 255, this implies that the JP2 Header box contains a 'Bits Per Component' box. There are numerous other examples; the important thing here is that I have tried to make jpylyzer as exhaustive as possible in this regard. It is also worth pointing out that jpylyzer checks whether any embedded ICC profiles are actually allowed, as JP2 has a number of restrictions in this regard. There is a slight (intentional) deviation from the standard here, as an amendment to the standard is currently in preparation that will allow the use of "display device" profiles in JP2. The current version of jpylyzer is already anticipating this change, and will consider JP2s that contain such ICC profiles valid (provided that they do not contain any other errors of course). Support of the Palette and Component Mapping boxes (which are optional sub-boxes in the JP2 Header Box) is not included yet. The current version of jpylyzer recognises these boxes, but doesn't perform any analyses on them. This will change in upcoming versions. The analysis and validation of the image codestream is still somewhat limited. Currently jpylyzer reads and validates the required parts of the main codestream header (for those who are in the know on this: the SIZ, COD and QCD markers). It also checks if the information in the codestream header is consistent with the JP2 image header (the information in both headers is partially redundant). Finally, it loops through all tile parts in an image, and checks if the length (in bytes) of each tile-part is consistent with the markers that delineate the start and end of each tile-part in the codestream. This is particularly useful for detecting certain types of image corruption where one or more bytes are missing from the codestream (either at the end or in the middle). Extract its contents to an empty directory, and then simply use 'jpylyzer.exe' directly on the command line. From the first responses I received it appears that jpylyzer's output format, and in particular the fields under the 'tests' element may create some confusion. 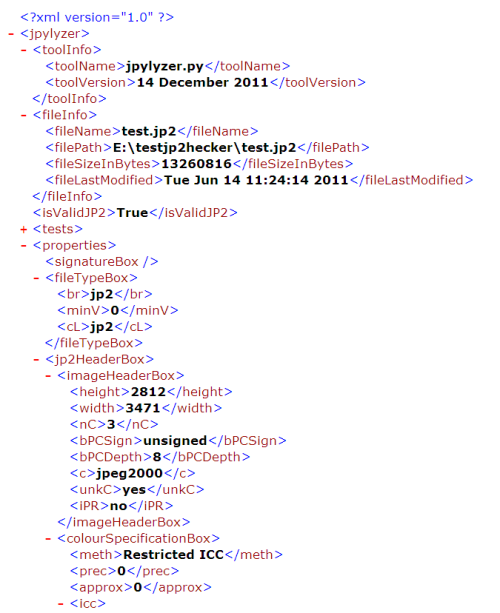 The 'test' element contains the outcome of every single test that jpylyzer performs. A file is considered 'valid' if it passes (i.e. returns 'true' for) each test. However, the 'isValidJP2' element at the root of the XML tree will tell you straightaway whether a file is valid or not. The 'tests' element is mainly included for illustrative purposes, and the reporting of individual test outcomes will most likely change in future versions (e.g. by reporting only which tests failed, if any).